What if the lenses do not look good on me, or don't fit comfortably? We offer a full 30-day guarantee for any vials or boxes of contact lenses that are unopened. However we do not offer any refunds or exchange of contact lenses once they have been opened, based on the colour was not what you expected, the lenses did not look good on you or the lenses did not feel comfortable. Ordering online from Contactlensesexpress.co.uk is very simple. Start by finding your contact lens type in the left hand link and then find your particular contact lens type. Click on the picture depicting your lenses and then enter your prescription details on the next page. As a first time customer you will have to fill in your personal details, name, address etc. follow the prompts and you will be then taken to the checkout, thereafter we require your opticians details, date of birth and date of last prescription. You will then be required to enter your credit/debit card details. Do you accept money orders or cheques? No, unfortunately we are not able to accept money orders or cheques at the moment. Do you need a copy of my prescription? Yes, you need to send us a copy of your valid and unexpired prescription to order contact lenses from us, if you do not have one simply give us your optician's details and we will obtain it for you. We strongly recommend that you visit your optician or eye doctor on a regular basis for check-ups, and to make sure that your prescription hasn't changed. There are a number of serious problems and health risks that can go unnoticed if you don't go for regular check-ups to your optician's, some of them could cause a loss of vision and even blindness. I have never worn contact lenses before. Can I order lenses from you? We advise you to have a contact lens fitting with your optician before purchasing contact lenses. This will ensure that the lenses you wish to order are suitable for your eyes. Your opticians is obliged to provide you with your contact lens prescription even if you are not purchasing your lenses from them. A member of the Contact Lenses Express team may contact you to verify your prescription. Will I receive the same lenses my optician prescribed when I order from you? Yes, the lenses we deliver are exactly the same lenses sold to opticians worldwide who then dispense them to their patients. 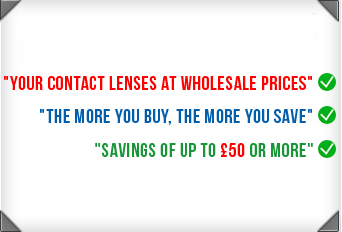 The only difference is that we supply these lenses at big savings and without the hassle. Why do I need to give you a prescription? Under UK law, we need a current contact lens prescription (< 1 year) in order to supply replacement contact lenses. If you have a prescription for eyeglasses it will look very similar to a prescription for contact lenses, but it is the contact lens specification and prescription that we need in order to supply you with contact lenses, you can also find these details on your contact lenses boxes. Yes, there is a special type of soft contact lens called a Toric lens, which will correct your astigmatism. How do I know if my contact lenses are worn out? Typical signs that a lens is approaching the end of its life are hazy vision, discomfort, and lens discolouration and deposits. These can lead to allergies and other complications, so we urge you to replace them on time, as recommended by your optician. I wear contact lenses occasionally, at the most once or twice a week. Which type of lenses should you go for? A soft daily lens is more appropriate for occasional wear they are also very convenient no solutions or cases are needed with these. Daily contact lenses are easy to adapt to. Some types of these lenses are Johnson & Johnson 1 day acuvue and cibavision focus dailies. Today's high quality lenses are suitable for young and old eyes alike. However we do not supply contact lenses to under 16's. What happens if my goods do not arrive? If you've placed an order your goods should be with you within a reasonable time (7-10 days) contact our customer service department at cs@cleuk.com and explain the problem. Contact lenses have become a real necessity for those who are suffering from different kinds of eye diseases. Find the information you need about contact lenses from history to different types of lenses visiting this site. Where can I find further information on Eyecare?